Proven to be substantially more fuel efficient than the current industry leader, strength tested for longevity of life and with the superior cut of a global leader, the Trimax Vulcan is the new standard in maintenance mowing. With over 35 years of innovation and development our rotary mowers have changed mindsets around the world and slashed the costs of maintaining traditional reel-mown applications. 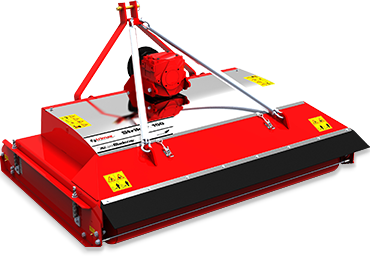 Now the same technology is available as a Castor Wheel Mower…introducing the Trimax Vulcan. IT’S ALL IN THE DETAIL…AND THE DATA! Based on tractor fuel consumption research by Virginia State University and current US fuel prices, an 80hp tractor on a warm season turf farm uses an average of $31,334* fuel per year. Early stages of side-by side comparison and torque testing collected from both the Trimax Vulcan and the current industry leading mower show a significantly reduced PTO power requirement for the Trimax Vulcan – a result which will significantly benefit turf farms through reduced fuel costs. Conclusive and exact fuel savings figures will be available for release early 2019. Two feet wider than commonly available 22′ castor wheel mowers, the Trimax Vulcan 24′ provides a 9% wider cut. This wider cut along with the substantially lower PTO power requirements establishes the Trimax Vulcan as the most efficient acres per hour castor mower option available. Subjected to Highly Accelerated Life Testing during research and development the Trimax Vulcan chassis will withstand over 10 years of full­time commercial use. Designed with less steel-on-steel wear between the major articulation and pivoting components and with sacrificial bushes and thrust washers, metal-on-metal contact is prevented providing a longer mower life and minimal maintenance costs over time. The Trimax Vulcan uses Trimax LazerBladez. With their unique tilt-forward fling-tip blade design LazerBladez produce a clean cut and minimal tearing which encourages faster regrowth and minimizes the risk of grass disease. Studied by the Sports Institute of New Zealand LazerBladez were found to have a blade cut equal to that of reel mowers. Trimax’s manufacturing process also ensures all surfaces critical to cut height and accuracy have not been left to chance! 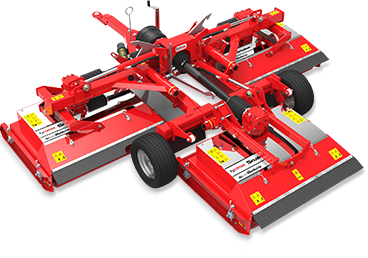 The result – mowers that leave the factory with a guaranteed even cut height, every time. GAIN THE ADVANTAGE OVER YOUR COMPETITION. We believe that mowing equipment should be more than just functional and should cut time, maintenance, costs….and grass. Our mowers have low total cost of ownership for maximum return on investment. Sharing Trimax DNA with our established Trimax Pegasus roller mower, the Trimax Vulcan is the latest addition to the Trimax range and is designed to give you the advantage over your competition. Gain the advantage over your competition and call 770-412-8402 today for a free demo! *Warm season grass mowing hours calculated on running 10 hours a day, 6 days a week in the high season. 5 hours a day, 5 days a week in the low season. Does not include implements or operator variables.